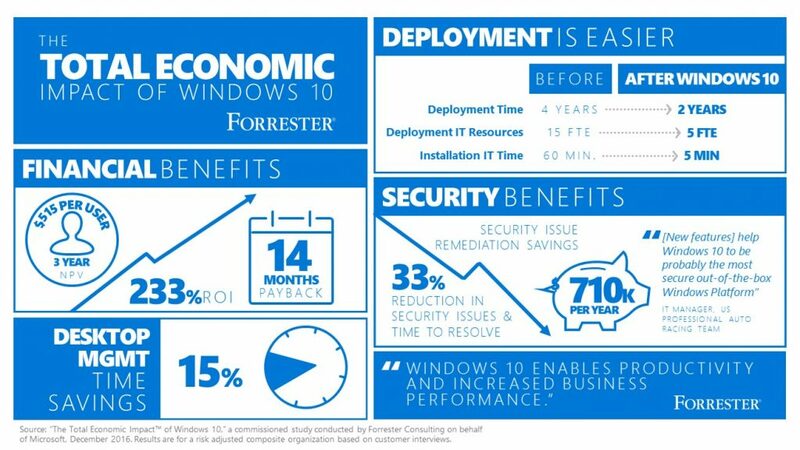 Editor’s Note: Last year, we shared Forrester Consulting’s Total Economic Impact (TEI) study of Windows 10 (June 2016) which found significant IT management cost savings, security and productivity benefits for Windows 10 customers. In December 2016, Forrester Consulting on behalf of Microsoft updated the study with insights from four additional customers which brings the total number of customer participants to eight. We have updated the blog to reflect the latest data which provides evidence that Windows 10 can help drive business impact. With more than 400 million monthly active devices now running Windows 10, enterprises are moving faster than ever to the most secure Windows 10. We designed Windows 10 to be the most secure Windows ever, ease management efforts and create more personal and productive computing experiences across devices. Customer satisfaction is at an all-time high because of the security and productivity features, which are behind the strong adoption and overall satisfaction. It has been great to see the market reaction to Windows 10 which has been unprecedented with a 3X increase in Windows 10 enterprise deployments. Last June, we commissioned Forrester Consulting to conduct a Total Economic Impact™ (TEI) study of Windows 10 to demonstrate how Windows 10 is having a positive impact to our customers’ bottom line. To continue to understand the benefits and costs associated with a Windows 10 implementation, Forrester interviewed four additional enterprise customers across various industries who were early adopters of Windows 10, including a government health department, a multinational food and beverage conglomerate, a global IT services firm and a global IT hardware and software vendor. The updated study shows the three-year net present value of benefits per user increased from $403 to $515 and the Return on Investment grew from 188% to 233%, with a payback period of 13 to 14 months. This updated study helps provide further evidence that Windows 10 can drive significant cost savings, security and productivity benefits for enterprise customers. Enterprises that leverage the new tools in Windows 10 to deploy the updated operating system (OS) more quickly and easily than with past efforts have experienced improved boot times, application access, security, and mobility which has helped IT and users increase their productivity and complete their work more effectively. These gains in efficiency and productivity have not only resulted in reduced IT costs but also helped drive new business especially for companies that sell technology services as employees who use Windows 10 to work with customers can show their commitment to the latest technology and avoid risking a sale. Below are a few of the highlights of the benefits for the composite organization based on the eight customers* who have now been interviewed for this commissioned study. The below insights from the June 2016 commissioned study remain unchanged. Windows 10 requires less IT administration time to install, manage, and support, with easy-to-use features and more self-service functions. One customer found that deploying Windows 10 was quicker and easier by as much as 50% from their last operating system upgrade and overall IT administrators estimate a 15% improvement in IT management time with Windows 10 — valuable time back to help in other key IT areas. With Windows 10 and System Center Configuration Manager (SCCM), organizations are able to provide employees self-service tools allowing them to conveniently find and install a line of business applications. With new features in Windows 10, businesses also found a reduction on costs associated with third party software application licenses that were no longer needed. With new features such as Credential Guard, Device Guard and improved security features such as BitLocker, security events related to client device management requiring IT remediation are reduced or avoided altogether. Forrester estimated some of the businesses could be saving up to nearly $700,000 a year by enabling security features in Windows 10. Improvements, such as faster boot times, convenient access to corporate applications, increased security, and better mobility tools help IT and users increase productivity and complete work more quickly and effectively. Employees, especially mobile workers, estimate they have 25% more time to get work done than they did before. Take a look at the updated TEI Study and take a look at Windows 10 if you haven’t already. See how it can help you reduce IT costs, reduce security remediation, improve productivity and increase ROI within your organization!